Inter-County Hospitalization Plan, Inc. 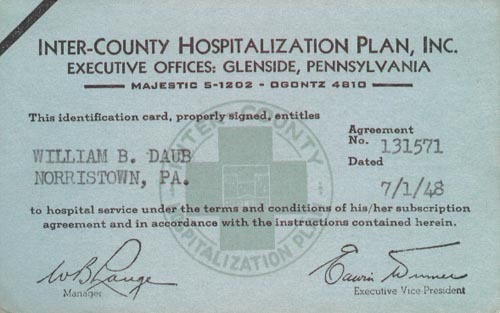 This identification card, properly signed, entitles William B. Daub, Norristown, PA. to hospital service under the terms and conditions of his/her subscription agreement and in accordance with the instructions contained herein. 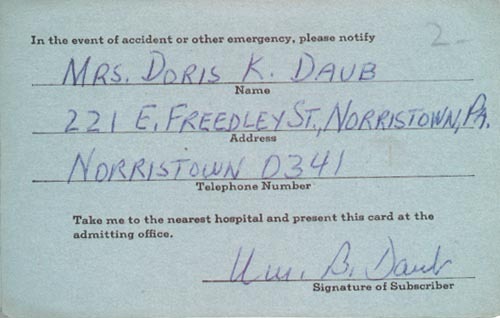 In the event of accident or other emergency, please notify Mrs. Doris K. Daub, 221 E. Freedley St., Norristown, PA.
Are you looking for DAUB ancestors? If so, we suggest posting a query to our Community Message Board to get assistance from other researchers.